Please consider making a donation through Paypal. All proceeds benefit further work through our Non Profit Organization. All donations are tax deductible. We thank you for your support! You now have the opportunity to help AIM through future purchases! Amazon Smile will donate a portion of the proceeds to Autism Is Medical. Please follow the link below to set up AIM as your charity. We appreciate you sharing this with your friends! 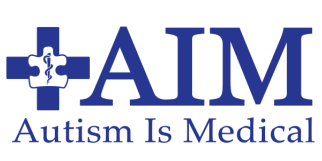 AIM is a proud partner of CARE Medical History Bracelets & Keychains. AIM T-Shirts are also available NOW! Please check back often for new products. Thank you for your support! Quiet Lion Creations by Allison B. Cooling has designed a bracelet as a chic way to support the cause. Glass pearls mix with a hand-stamped metal charm & pave rhinestone birthstone bead to create a comfortable, customized accessory. A magnetic clasp is used for easy wearing. Each piece is handmade at the time of purchase. A portion of the proceeds will be donated to Autism Is Medical. We truly appreciate the generosity so please visit Quiet Lion Creations website.